So, last week I was looking through the steam store and saw a game on the front page called "Lone Survivor", which touted itself as a "psychological survival adventure". 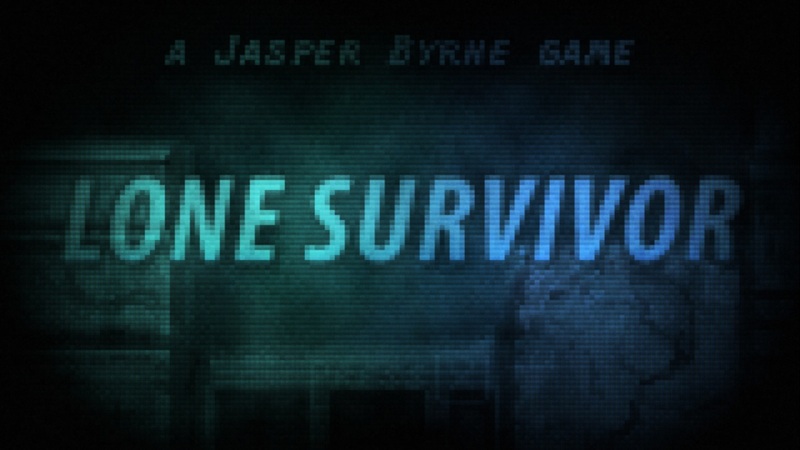 I'm a big fan of survival horror and psychological themes in games, so this sounded like it was right up my alley. After playing it, though, I must say that it fails on those points (but it does almost make up for it elsewhere). So basically you play as some dude, living in an apartment building in a ruined post-apocalyptic city ravaged by a strange disease that turns people into shambling monsters with a hunger for human flesh (sounds familiar, no?). Your main goal is to escape the city and find other survivors (if there are any). The game disappoints on the whole "psychological" aspect right off the bat by basically establishing that your guy is crazy from the word go. Pretty much the first thing you do in the game is go to your friend's apartment across the hall (didn't the game say there weren't any other survivors?) where there's a party going on. Next minute she disappears, the party's over and there's zombies in the room with no explanation of what happened. There is a mental health mechanic in the game, where apparently not eating random crap, not taking drugs, sneaking past the zombies instead of killing them and doing a whole heap of other arbitrary crap gets you a better ending. I played through doing what comes naturally (i.e. trying to play that way but then getting bored and failing miserably) and got a D+ for mental health and a pretty disappointing ending. I guess I could play the game again and try harder to get the good ending, but then the gameplay (while not completely terrible) wasn't exactly enthralling enough to warrant me doing that. Gameplay consists of a fairly standard adventuring (find item, stand in the right spot and use it) with a dash of stealth in the form of avoiding the zombies (the game doesn't call them zombies but they are bloody zombies). The actual puzzles are disappointingly straightforward, so the only challenge comes from making your way back and forth between the zombies while you're trawling the map for every item you can find. This really becomes a chore before long, which is why i was so inclined to forget about the mental health system and cap every zombie I saw so that I didn't have to sneak around them the long way.You also have to eat food and sleep properly to stay alive, and you can cook certain kinds of food to make them taste nicer as part of that mental health thingy. This leads me to the only part of the game that I really liked, which was the characterization. At first the guy you play as came across as being one of those emotionless tossers you see all too often in games. The mask he wears has him permanently frozen in the same facial expression and his running monologue wasn't exactly enthralling me either. But he has just enough nice character moments (such as making friends with a shadowy figure, or being able to cook food when he finds the gas cylinder) to make me invested in his survival on a personal level. The fact that I was genuinely interested in finding out what would happen to him next is pretty much the only reason I kept playing. And thanks to the main character being insane there were enough entertaining moments to maintain my interest in the plot. So I guess this is proof that a good story can save a game from total damnation. Anyway, I guess the only thing left to talk about it the horror aspect. Well, It's not scary. I was a bit surprised myself, since the (very) pixellated graphics and generally dark colour scheme give the levels a very gritty, oppressing feel. Unfortunately the other elements of the game completely ruin this feeling. For starters when you're so much as in the same room as a zombie this loud static noise starts up, which removes that feeling of uncertainty that is used to create tension in good horror games. As well as this even when you don't have your flashlight on the screen is bright enough that you can see the zombies on screen perfectly. So yeah, it fails as a horror game too. Overall, not a great game. The story brings it up to a passable level (even if the actual gameplay was mostly crap), and it's smart enough not to drag on too far. The ending I got was a disappointment, but I guess it would be a bit mean of me to judge the game on that when there might be a really good ending tucked away somewhere else in my steam folder (though I will judge it for having a weird choices system in the first place). And the game didn't technically advertise itself as a horror game, so it would be unfair of me to deduct points from it for that. there's certainly worse ways to spend $10, but a much better way to spend it would be to go see Cabin in the Woods. Seriously, that movie was awesome.